Structural changes in chromosomes can lead to birth defects, syndromes or even cancer. Chromosomal changes may have no effect on a person's health. Cytogenetic analyses are commonly performed during pregnancy to determine if there is an indication that the fetus is at risk for common aneuplodies (syndromes caused by having extra or missing chromosomes), syndromes caused by structural abnormalities (like unbalanced translocations or inversions), or to determine if extra or missing genetic material is present. The diagnosis and treatment of several leukemias and lymphomas, as well as some solid tumors, depends today on cytogenetic analysis of specific chromosomal aberrations that are consistently observed in these particular cancers. The analysis of chromosomes in human development and disease is accomplished through classical cytogenetic procedures, such as G-banding, combined with advanced molecular techniques such as FISH and genomic microarray analysis (CGH) as well as next generation sequencing (NGS). ⇒ chromosomes are condensed. The chromosomes are stained with Giemsa dye, resulting in a banding pattern of light and dark stripes, known as G-banding. The patterns are specific, allowing to identify each chromosome. ⇒ tasks such as chromosome analysis. In addition, studies have shown that slides prepared using the robotic harvesting show an improved consistency and indeed an overall improvement in quality over manual coverslip harvesting methods. ⇒ places one half of the buckets in the centrifuge in order for the system to begin its parallel processing. Sensors are linked to alarms which will alert the user if the centrifuge is out of balance or misloaded. Each bucket has a unique ID on the corresponding loading tray and the corresponding run data is logged which may then be downloaded from the system for audit purposes. ⇒ humidity, within a larger climate controlled cabinet. The ProCell cytogenetics reagents range is designed to improve culture failure rates, mitotic index, metaphase spreading, banding resolution and overall quality of bone marrow, lymphoma, solid tumour, blood, CVS and Amniocentesis samples for cytogenetic analysis. ⇒ and micro duplications. Array CGH is also referred to as CGH array, aCGH or simply a microarray. 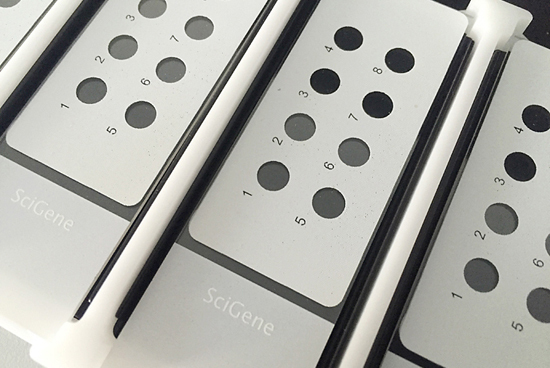 Array CGH compares a patient DNA sample with a control DNA sample and identifies differences between the two sets of DNA. ⇒ equipment for all major platforms. ⇒ developed to eliminate nagging concerns of ozone corrupted array data caused during array washing and scanning. ⇒ and/or to further confirm chromosomal abnormalities found by other assays such as karyotyping and array-based comparative genomic hybridization (aCGH).FISH, also known as whole chromosome painting, is valuable in defining rearrangements among different chromosomes and the origin of ring and marker chromosomes that are not clearly deciphered by karyotype analysis. ⇒ Accurately detects slide temperatures using SlideSense technology for more reproducible results. ⇒ drawers. Requires the use of CytoBond Removable Coverslip Sealant to temporarily seal coverslips to slides, providing an evaporative seal over prolonged incubations and high temperatures without humidification. ⇒ not serving as an Agilent Sales Agency we will make contact to the college serving your area. ⇒ to 24 slides following optimized protocols. The system eliminates messy jars, waterbaths and staining dishes used in manual methods, freeing up valuable technician time. ⇒ jars, water baths and staining dishes used in manual methods, freeing up valuable technician time.